Last week, CosmoQuest held a 32-hour Hangout-A-Thon fundraiser and it was a spectacular, fascinating and enormously entertaining event that resulted in more than $23000 in donations. A couple of days before, Pamela Gay and Nicole Gugliucci had asked a group of regular viewers and commentators if they would like to appear in a segment to talk about, amongst other things, how they found CosmoQuest and what they like most about them. Because I don’t have the technical capability to join a hangout at the moment due to slightly too old computers and a slow upstream, I just joined in via the comments and wrote a short post there. I had promised to write a blog posting about my journey to CosmoQuest, but was not able to finish it in time for the hangout. Now I have, but it has become a bit longer than intended and metamorphosized into this article about discovering science and the state of science news and education in general. I’ve been always curious about science and astronomy and while I did not grow up to be a scientist, which had mostly to do with the fact that my science education in school was absolutely terrible, I never lost my curiosity – what I learned about science, I learned at home with the aid of many, many books. The path to being a curious internet user was probably paved with my first own computer in 1989 and less than ten years later I had arrived in the web, which even in the early modem days became an invaluable source of knowledge. The first time the internet became really useful regarding space exploration was when the first Mars lander Pathfinder and its rover Sojourner landed in 1997. We still had to watch the landing on CNN because NASA TV was not yet streaming over the web, but we were able to see the first pictures coming in on the NASA website. Around that time, when Netscape 2.0 or 3.0 were state-of-the-art and the go-to search machine was AltaVista, I was building a giant link library. While poking around the web searching around for more sources about spaceflight and exploration, I found a lot of good stuff, but also a lot of conspiracy theorists, cranks and other entertaining diversions. But there was someone combating all the nonsense: Phil Plait, an astronomer running a website called Bad Astronomy, debunking all the crazy stuff out there. Back then, Phil did not even have a blog, but as far as I can remember it was through him that I found the space and astronomy news website Universe Today sometime around early 2000. In these days, Universe Today had become on of my main news sources for everything about science and astronomy, especially after the reporting in the mainstream media had started to slack off in the mid-2000s. The low point was probably in 2008, when CNN had fired its entire science, environment and technology unit including the space reporting veteran Miles O’Brien. And it would have gotten steadily worse if it wasn’t for a few other journalists like Alan Boyle from NBC and, in a completely independent way, Fraser Cain with Universe Today and Phil Plait, who had already begun to transform his Bad Astronomy website into a blog in 2005. At some point I had vaguely become aware of a podcast called Astronomy Cast through Universe Today, but back then I had no real interest in podcasts, because I did not own a portable mp3 player yet. That changed in late 2009 when I first got an old Palm Tungsten T3, which was my first portable device capable of playing mp3s. When I finally got the first real mp3 player in the following spring, the audiobook and podcast fever had broken out completely. There was so much amazing stuff out there – giant podcast archives everywhere and especially Astronomy Cast with episodes in the triple digits proved to be a brilliant source of knowledge and even entertainment. Listening to podcasts while doing other mindless tasks is wonderful, and I’m not even driving a car like a friend of mine who has to do a lot of traveling, relying on podcasts and audiobooks to combat boredom. And then, in late 2011, something even more amazing happened, which also took me more than half a year to become aware of: Pamela Gay and Fraser Cain had started to record Astronomy Cast as a live video broadcast and there was also something called the Virtual Star Party and a Weekly Science Hangout, the latter even appearing in the audio feed of Astronomy Cast. I have to admit that I wasn’t really paying attention to this development for a long time, but I also heard about this citizen science organisation called CosmoQuest getting involved with all these projects. 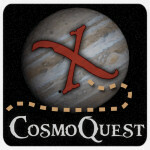 The first time I really became aware of CosmoQuest was when they merged the web forums of Universe Today and Bad Astronomy under the CosmoQuest banner. When I read in June 2012 that the people of Universe Today and CosmoQuest wanted to do a live hangout on air during the Venus transiting the Sun and it was even halfway convenient for my local timezone, of course I wanted to watch it – but it turned out that I wasn’t allowed to from Germany! Apparently we have some obscure laws which say that all kind of broadcasters which have an audience of more than a couple of hundred viewers have to get a state license. For this reason Google had not included Germany in the initial batch of countries allowed to watch the Hangouts on Air. Strangely enough, we were allowed to watch the recorded versions! I was really mad about the situation and not the only one – there had been a lot of protests, but at that point there was nothing to do except be grumpy and wait. In mid-August 2012 Google had finally resolved the situation – what really happened behind the scenes is still unknown, but I guess they just went for it and let Germany into the Hangouts, saying that not they, but the users are responsible for broadcast licenses. I can’t remember which hangout I watched first, but it was probably Astronomy Cast, of which I already had watched a couple of the recorded hangouts before. Watching live, only with a delay of at worst a couple of seconds, had one huge advantage: suddenly it was possible to ask questions and comment in real-time! But I must admit I was at first a bit hesitant to ask anything and thinking of coherent questions in the first place is not easy either, especially if the theme of a hangout is not one’s metier. But there are no dumb questions and everyone at CosmoQuest & Co are aware that their viewers are not scientists and are only happy to explain everything, because that’s their job: making science accessible to everybody. During my discovery of CosmoQuest I had also overcome my aversion against social networks and finally joined Facebook and later Google+ in late summer 2012. While Facebook had become just a necessity to keep contact with family and a few friends, Google+ turned out to be the place where everything is happening – because, amongst many other things, CosmoQuest, Universe Today and their many collaborators and friends almost exclusively work within the realms of Google’s social network. They are one of the reasons why Google+ is so amazing – by using the network as a communication tool in both directions, not only providing content but also actively engaging their readers, it has become an amazing community for everybody interested in science and astronomy. CosmoQuest, Universe Today and also the Planetary Society fill a huge gap left open by the traditional media in the fields of science and astronomy – that’s the main reason I’m so fascinated about what they are doing. They have proven that you don’t need a multi-million-dollar television studio to produce great hangouts and show that behind every ph.d. scientist is just a human being like you and me. These are not scientists that look down on the laypeople, quite the contrary: CosmoQuest’s motto is basically “anyone can do science”. But if you do not have a sense of wonder and find science boring, you may be in the wrong place – I, for one, certainly am not. But why am I sitting here in Germany cheering for an American organisation? Because I am constantly reminded by CosmoQuest that science education in Germany is not in a very healthy state. I don’t know if it has gotten any better in the last fifteen years since I have finished school, but I have certainly suffered from the bone-dry and completely theoretical school education in all the scientific subjects. I was not really learning, I was only memorizing dull facts that I mostly forgot afterwards. If it wasn’t for the curiosity prevalent in our family, this education would have certainly scared all of it our of me. Every time I watch or listen or read anything from the CosmoQuest crew, I always think what would have been if I had had teachers like them at school! Having listened to so many podcasts and having watched so many hangouts it’s only fair to give a little back. This is why I sent them a small donation, but it’s also the reason why I keep commenting, asking questions and publicizing their work as much as I can. It’s the least I can do in return for their amazing work and I’m very glad that I’m not alone. So, thank you everybody at CosmoQuest, Universe Today, the Planetary Society and everone else involved for enriching and infusing our lives with even more science and astronomy goodness than has already been here before!